Posted on December 12, 2013, 2:02 pm, by Google Webmaster Central, under advanced, intermediate, structured data, webmaster tools. Since we launched the Structured Data dashboard last year, it has quickly become one of the most popular features in Webmaster Tools. We’ve been working to expand it and make it even easier to debug issues so that you can see how Google understands the marked-up content on your site. Starting today, you can see items with errors in the Structured Data dashboard. This new feature is a result of a collaboration with webmasters, whom we invited in June to>register as early testers of markup error reporting in Webmaster Tools. We’ve incorporated their feedback to improve the functionality of the Structured Data dashboard. We’ve added a separate scale for the errors on the right side of the graph in the dashboard, so you can compare items and errors over time. This can be useful to spot connections between changes you may have made on your site and markup errors that are appearing (or disappearing!). Our data pipelines have also been updated for more comprehensive reporting, so you may initially see fewer data points in the chronological graph. Check to see if the markup meets the implementation guidelines for each content type. In our example case (events markup), some of the items are missing a startDate or name property. We also surface missing properties for nested content types (e.g. a review item inside a product item) — in this case, this is the lowprice property. Click on URLs in the table to see details about what markup we’ve detected when we crawled the page last and what’s missing. You’ll can also use the “Test live data” button to test your markup in the Structured Data Testing Tool. Often when checking a bunch of URLs, you’re likely to spot a common issue that you can solve with a single change (e.g. by adjusting a setting or template in your content management system). Fix the issues and test the new implementation in the Structured Data Testing Tool. After the pages are recrawled and reprocessed, the changes will be reflected in the Structured Data dashboard. 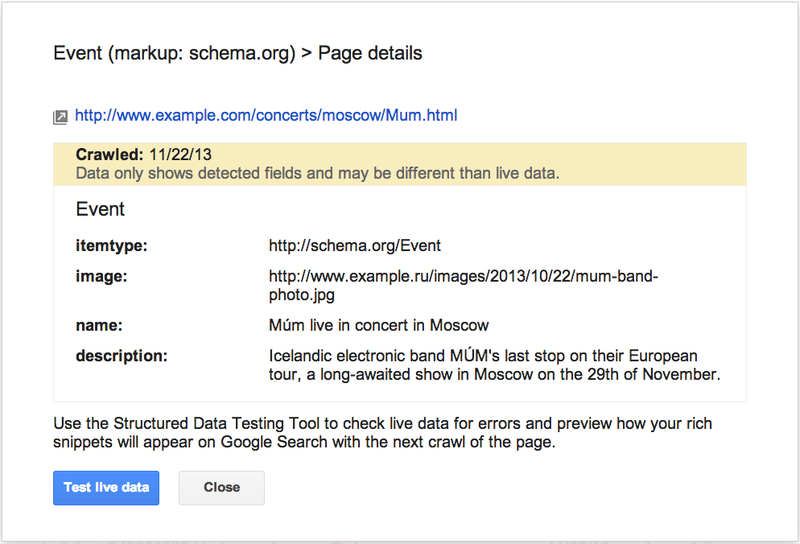 We hope this new feature helps you manage the structured data markup on your site better. We will continue to add more error types in the coming months. Meanwhile, we look forward to your comments and questions here or in the dedicated Structured Data section of the Webmaster Help forum. Posted on August 21, 2013, 1:00 pm, by Maile Ohye, under advanced, intermediate, structured data. 1. What kind of pages can be used with authorship? The URL/page contains a single article (or subsequent versions of the article) or single piece of content, by the same author. This means that the page isn’t a list of articles or an updating feed. If the author frequently switches on the page, then the annotation is no longer helpful to searchers and is less likely to be featured. The URL/page consists primarily of content written by the author. You’re free to write articles in the manner you prefer — your users may really like the Pied Piper idea. However, for authorship annotation in search results, Google prefers to feature a human who wrote the content. By doing so, authorship annotation better indicates that a search result is the perspective of a person, and this helps add credibility for searchers. Again, because currently we want to feature people, link authorship markup to an individual’s profile rather than linking to a company’s Google+ Page. should I link to two separate author/Google+ profiles written in each language? should link to the same Google+ profile in the author’s language of choice. 4. Is it possible to add two authors for one article? In the current search user interface, we only support one author per article, blog post, etc. We’re still experimenting to find the optimal outcome for searchers when more than one author is specified. 5. How can I prevent Google from showing authorship? The fastest way to prevent authorship annotation is to make the author’s Google+ profile not discoverable in search results. Otherwise, if you still want to keep your profile in search results, then you can remove any profile or contributor links to the website, or remove the markup so that it no longer connects with your profile. 6. What’s the difference between rel=author vs rel=publisher? rel=publisher helps a business create a shared identity by linking the business’ website (often from the homepage) to the business’ Google+ Page. rel=author helps individuals (authors!) 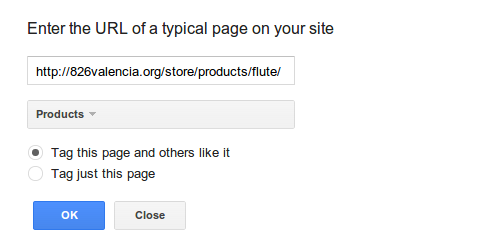 associate their individual articles from a URL or website to their Google+ profile. While rel=author and rel=publisher are both link relationships, they’re actually completely independent of one another. 7. Can I use authorship on my site’s property listings or product pages since one of my employees has customized the description? If you have additional questions, don’t forget to check out (and even post your question if you don’t see it covered in the Webmaster Forum. Posted on May 30, 2013, 2:00 pm, by Google Webmaster Central, under advanced, beginner, intermediate, structured data. If Google understands your website’s content in a structured way, we can present that content more accurately and more attractively to Google users. For example, our algorithms can enhance your search results with “rich snippets” when we understand that your page is a structured product listing, event, recipe, review, or similar. We can also feature your data in Knowledge Graph panels or in Google Now cards, helping to spread the word about your content. Today we’re excited to announce two features that make it simpler than ever before to participate in structured data features. The first is an expansion of Data Highlighter to seven new types of structured data. 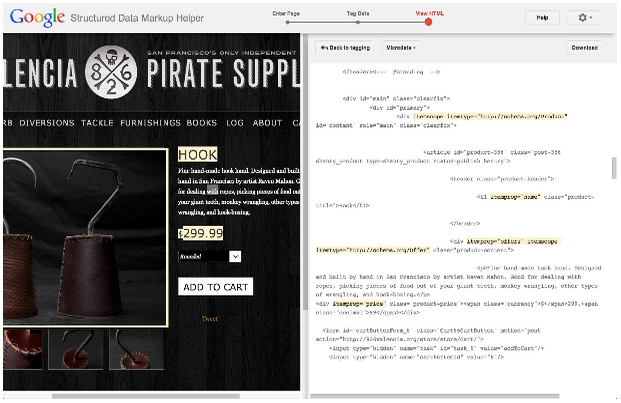 The second is a brand new tool, the Structured Data Markup Helper. 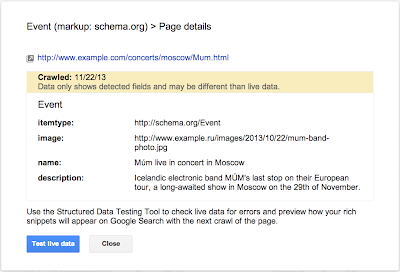 Data Highlighter launched in December 2012 as a point-and-click tool for teaching Google the pattern of structured data about events on your website — without even having to edit your site’s HTML. Now, you can also use Data Highlighter to teach us about many other kinds of structured data on your site: products, local businesses, articles, software applications, movies, restaurants, and TV episodes. Update: You can see the full list of schemas supported in Data Highlighter here. To get started, visit Webmaster Tools, select your site, click the “Optimization” link in the left sidebar, and click “Data Highlighter”. You’ll be prompted to enter the URL of a typically structured page on your site (for example, a product or event’s detail page) and “tag” its key fields with your mouse. The tagging process takes about 5 minutes for a single page, or about 15 minutes for a pattern of consistently formatted pages. At the end of the process, you’ll have the chance to verify Google’s understanding of your structured data and, if it’s correct, “publish” it to Google. Then, as your site is recrawled over time, your site will become eligible for enhanced displays of information like prices, reviews, and ratings right in the Google search results. While Data Highlighter is a great way to quickly teach Google about your site’s structured data without having to edit your HTML, it’s ultimately preferable to embed structured data markup directly into your web pages, so your structured content is available to everyone. To assist web authors with that task, we’re happy to announce a new tool: the Structured Data Markup Helper. Like in Data Highlighter, you start by submitting a web page (URL or HTML source) and using your mouse to “tag” the key properties of the relevant data type. When you’re done, the Structured Data Markup Helper generates sample HTML code with microdata markup included. This code can be downloaded and used as a guide as you implement structured data on your website. The Structured Data Markup Helper supports a subset of data types, including all the types supported by Data Highlighter as well as several types used for embedding structured data in Gmail. Consult schema.org for complete schema documentation. 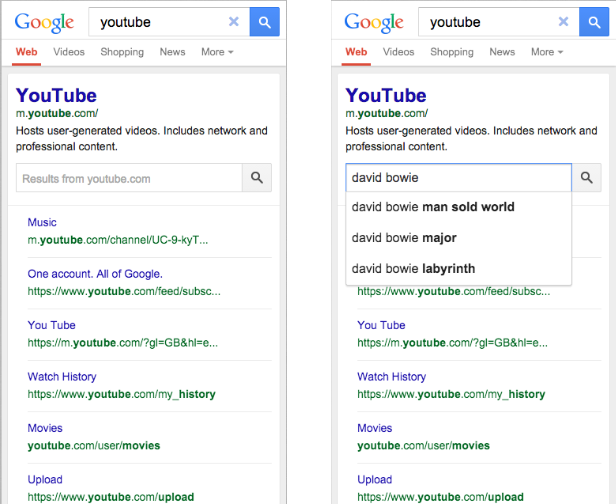 We hope these two tools make it easier for all websites to participate in Google’s growing suite of structured data features! As always, please post in our forums if you have any questions or feedback. Posted on December 12, 2012, 5:09 pm, by Google Webmaster Central, under search results, structured data, webmaster tools. Update 19 February 2013: Data Highlighter for events structured markup is available in all languages in Webmaster Tools. 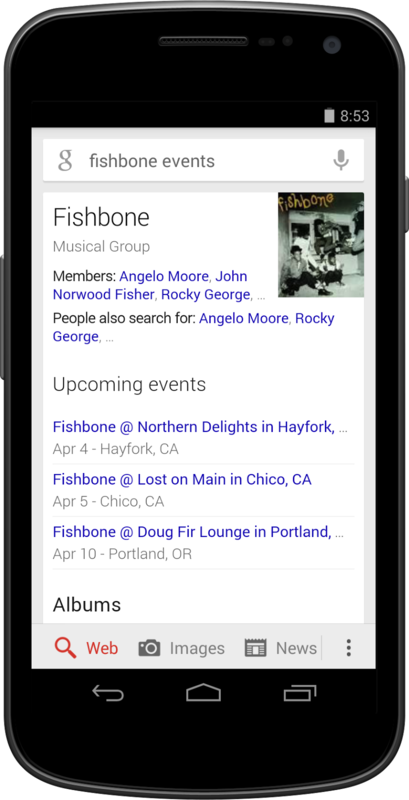 At Google we’re making more and more use of structured data to provide enhanced search results, such as rich snippets and event calendars, that help users find your content. Until now, marking up your site’s HTML code has been the only way to indicate structured data to Google. However, we recognize that markup may be hard for some websites to deploy. Today, we’re offering webmasters a simpler alternative: Data Highlighter. At initial launch, it’s available in English only and for structured data about events, such as concerts, sporting events, exhibitions, shows, and festivals. We’ll make Data Highlighter available for more languages and data types in the months ahead. Update 19 February 2013: Data Highlighter for events structured markup is available in all languages in Webmaster Tools. If your page lists multiple events in a consistent format, Data Highlighter will “learn” that format as you apply tags, and help speed your work by automatically suggesting additional tags. Likewise, if you have many pages of events in a consistent format, Data Highlighter will walk you through a process of tagging a few example pages so it can learn about their format variations. Usually, 5 or 10 manually tagged pages are enough for our sophisticated machine-learning algorithms to understand the other, similar pages on your site. From then on, as Google crawls your site, it will recognize your latest event listings and make them eligible for enhanced search results. You can inspect the crawled data on the Structured Data Dashboard, and unpublish at any time if you’re not happy with the results. To get started with Data Highlighter, visit Webmaster Tools, select your site, click the “Optimization” link in the left sidebar, and click “Data Highlighter”. If you have any questions, please read our Help Center article or ask us in the Webmaster Help Forum. Happy Highlighting! Posted on October 3, 2012, 10:00 am, by Pierre Far, under advanced, beginner, intermediate, search results, structured data, webmaster tools. Traditional, text-only, search result snippets aim to summarize the content of a page in our search results. Rich snippets (shown above) allow webmasters to help us provide even better summaries using structured data markup that they can add to their pages. Today we’re introducing a set of guidelines to help you implement high quality structured data markup for rich snippets. Once you’ve correctly added structured data markup to you site, rich snippets are generated algorithmically based on that markup. If the markup on a page offers an accurate description of the page’s content, is up-to-date, and is visible and easily discoverable on your page and by users, our algorithms are more likely to decide to show a rich snippet in Google’s search results. Alternatively, if the rich snippets markup on a page is spammy, misleading, or otherwise abusive, our algorithms are much more likely to ignore the markup and render a text-only snippet. Keep in mind that, while rich snippets are generated algorithmically, we do reserve the right to take manual action (e.g., disable rich snippets for a specific site) in cases where we see actions that hurt the experience for our users. If your page is about a band, make sure you mark up concerts being performed by that band, not by related bands or bands in the same town. If you sell products through your site, make sure reviews on each page are about that page’s product and not the store itself. If your site provides song lyrics, make sure reviews are about the quality of the lyrics, not the quality of the song itself. In addition to the general rich snippets quality guidelines we’re publishing today, you’ll find usage guidelines for specific types of rich snippets in our Help Center. As always, if you have any questions or feedback, please tell us in the Webmaster Help Forum.